Khaadi has officially launched their Eid Collection 2017 with trendy designs and vibrant colors. All the dresses by Khaadi indulge in the true essence of Eid with a touch of luxury. The designs included in this eid collection are all novel and specially designed for Eid-ul-Fitr by keeping in mind the hot summer. 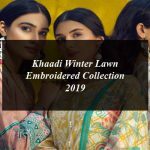 Khaadi has used many themes for categorizing the collections. The Eid Collection 2017 consists of three pieces and two piece suits along with embroidery work on shirts. Khaadi Eid Collection 2017 is now available for purchase via Online and stores. You can watch the catalog of Khaadi Eid Collection 2017 below with prices.